The pages here provide information and instructions on a variety of computing issues. If the answer isn’t here, contact the College Information Technology staff with details on the problem. Soon after you send that message, you will receive an automated reply. One of the IT staff will respond as soon as possible. More information about Information Technology at the College of Design is also available here. Below are news items about computing in the College of Design. Check back to get the latest news. Network cabling in Brooks and Kamphoefner Halls is being upgraded to current wiring standards. You will likely see University staff and contractors installing new cabling through the Fall 2018 semester. The new cabling will bring faster network speeds to the College of Design. Leazar Hall was re-wired previously and it not part of this project. For more information, please contact an IT staff member. Two Factor Authentication (2FA) provides more secure access to online accounts. Users are encouraged to use 2FA on any account that makes it available—specifically University Google Apps and Shibboleth log-ins. More information and links to set up 2FA for your University accounts are available at https://go.ncsu.edu/2fa. 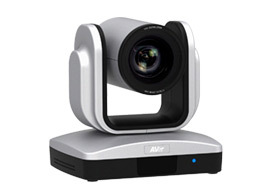 AVer VC520 video conferencing systems have been installed in conference rooms and our Digital Critique Spaces. These systems include a remote-controlled HD video camera and noise cancelling speakerphone. The systems work with any video conferencing software, such as Skype, Google Hangouts, Zoom, WebEx, Zoom, GoToMeeting, etc. Users only need to connect one USB cable to their computer and select the correct video and audio sources in the conferencing software they are using. More information and instructions on using these systems is available here. The College offers Digital Critiques spaces in Brooks 125, Brooks Rotunda, and the Allred Gallery in Kamphoefner G10, and Kamphoefner 130. 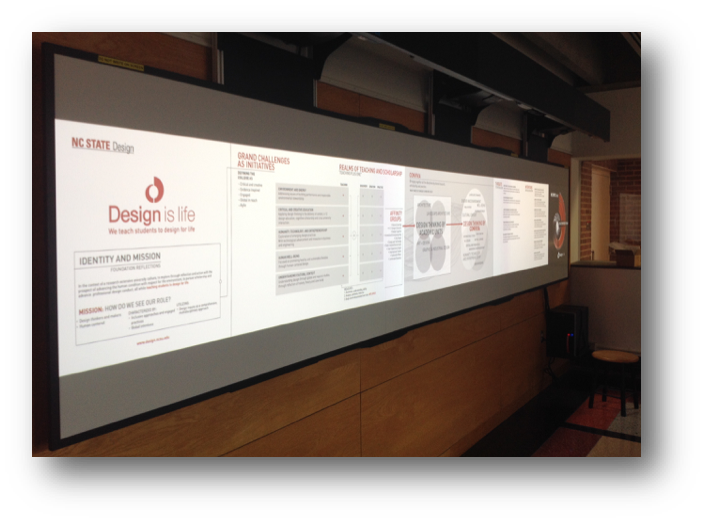 Save on your printing costs by using these display systems instead of printing large boards. More information and instructions on using these systems is available here. The College also offers three Collaborative Learning Studios, providing 4–6 collaborative stations in each room. Users can collaborate in small groups or work together as a whole class. Each station is connected with other stations in the room and with a main presentation display. 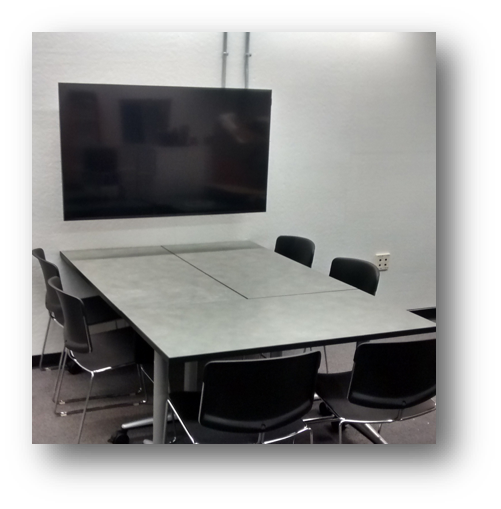 25 large monitors are deployed throughout the college for small group collaboration. In addition, the Bayley IT Lab offers several large touch-screen display systems for check-out. These systems include a portable, adjustable rolling stand, so they can be used throughout the College. The systems are available for checkout through the IT Lab. Try one of these monitors instead of printing large documents for your presentation or critique. Stop by the IT Lab in Brooks 203 and speak to an IT staff member for a demonstration or for more information. NC State has made arrangements with Microsoft to offer Office 365 to faculty, staff, and students. Access to Office 365 also includes downloads of Microsoft Office for various operating systems. For more information go to NC State’s Office 365 web site. This license also includes free access to Windows 10 for students. For more information, see the software.ncsu.edu site. You will need to log in using your Unity ID and password to access these sites. NC State has an agreement with lynda.com to provide free access for students, faculty, and staff to thousands of tutorials. Go to go.ncsu.edu/lynda for more information. Google Earth Pro is also now free to all users. For more information, see our Google Earth Pro web page. Autodesk offers many of its products free for students and faculty. A free Autodesk Education Community account is needed, but offers a long list of free software and other resources. For more information, see the Autodesk Education Community website. Adobe offers educational discounts on Creative Cloud to students. More information is available at the Adobe Education website. Select a plan that works for you. Use your @ncsu.edu email address at checkout to receive the 25 percent discount. Note: If you already have a CrashPlan for Home subscription, you can apply this discount when you renew. See Renewing CrashPlan for Home with an Employer or University Discount. PLEASE get into a good back-up habit! We have a quiet audio recording booth in the basement of Brooks Hall. The booth has a dedicated iMac computer and MIDI keyboard and is suitable for recording voiceover tracks and MIDI-based audio. Reserve the booth through the IT Lab Checkout Desk in Brooks 203. The Bayley IT Lab offers 3D printing for students, faculty and staff. A variety of materials is available. Good planning is necessary in order to have projects printed, as some projects can take several days to process. Please stop by the Bayley IT Lab in Brooks 203 to see the 3D printers and discuss your project with the IT staff. The College provides file space for courses and file transfer. des-classstore.sod.ncsu.edu is the name of the server which houses ClassStore and Transfer. ClassStore folders are available by an instructor’s request and provide file space for particular courses. Transfer is available to all of the College and provides space for users to transfer files from one computer to another. All files on Transfer are DELETED everyday at 8:00 a.m.
All files on ClassStore are DELETED the week after exams are over each semester. Faculty who would like to have a ClassStore folder for their course should fill out the ClassStore Folder Request form. Instructions for accessing ClassStore and Transfer are here. All College of Design students taking sophomore or higher studio courses are provided a high-speed network connection at their desk through StudioNet. There is no additional cost to students for StudioNet access. Wired connections are available in Brooks, Kamphoefner and Leazar Halls. Wireless connections are available in Brooks, Kamphoefner and Leazar Halls using the University’s Nomad ncsu wireless network. Registered students should not use the ncsu-guest wireless network because it only allows web access. Students wishing to use the wired network must have an RJ-45 ethernet connector in their computer along with a CAT-5 or CAT-6 ethernet cable. Cables are available at the NCSU Bookstores. Students wishing to use the wireless network must have an 802.11g compatible wireless card (also called WiFi or Airport) in their computer. Contact the College of Design Information Technology Staff for help. Students wanting to use a wired network connection should contact the College IT Staff for help. For more information, read the StudioNet instructions. NC State University REQUIRES use of an approved and up-to-date anti-virus program for all computers connected to the NC State network. Anti-virus software recommendations are available at http://www.ncsu.edu/antivirus/. NC State provides a wide variety of IT services through the Office of Information Technology. Information on resources available to students can be found at go.ncsu.edu/gogetit. All users must attend a Laser Cutter Certification session before they will be allowed to use the laser cutters. Contact the Materials Lab about signing up for a certification session. Peer-to-Peer file sharing is popular around the world. Many times this type of file sharing includes copyrighted music and movie files. The RIAA (Recording Industry Association of America) and the MPAA (Motion Picture Association of America) file lawsuits against individuals who use their computers to share copyrighted materials. College students are prime targets for this type of law suit. There are cases against NC State students which have cost them thousands of dollars. In order to comply with federal law, NC State must identify the owner of any computer caught sharing copyrighted material. Also, many of these file sharing programs open up computers to attacks and viruses. It’s safer just to get rid of these programs. The College of Design IT staff cannot take to time to repair your computer from damage caused by these programs. So, don’t risk lawsuits, hacks, and viruses! Get rid of your file sharing programs. They’re not worth it. Thanks for reading! Check back for more Computing NEWS. If you have any questions, please contact the College Information Technology staff.